Get ready for missile-shooting fun with your friends with this LEGO Star Wars Action Battle Echo Base Defense Set (75241). Build the Rebel base entrance gate, blaster tower, trench and AT-AT Walker. Then place the Rebel Troopers and Snowtroopers into position, load the missiles into the shooters, take aim and fire at targets! Can you send the AT-AT crashing to the ground before it blasts the gates open and overruns Echo Base? That is for you to decide in this action-packed Battle of Hoth themed set! This LEGO Star Wars Action Battle Echo Base Defense Set (75241) includes 5 LEGO Star Wars minifigures: 2 Snowtroopers and 3 Rebel Troopers, a Rebel base entrance gate, blaster tower, trench section with a buildable Probe Droid, and a collapsible AT-AT Walker. Each side has 3 targets to hit also contains 2 shooters and 4 missiles. This LEGO Star Wars Anakin Podracer 20th Anniversary Edition (75258) is a reinterpretation of the original 7131 model released in 1999. 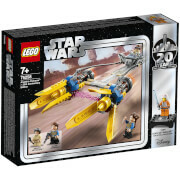 This set features big engines, extending flaps, space to fit the young Anakin minifigure in the cockpit and a play handle that let kids play out endless Star Wars: The Phantom Menace races around the living room. This cool building toy also includes a Padme Amidala minifigure plus a bonus Luke Skywalker minifigure and display stand with 20th anniversary logo to celebrate this milestone in LEGO Star Wars history. This LEGO Star Wars Anakin Podracer 20th Anniversary Edition (75258) includes 3 LEGO Star Wars minifigures: Anakin Skywalker, Padme Amidala and bonus anniversary Luke Skywalker in his X-Wing pilot suit on a detachable display stand. Help General Leia, Kaz Xiono and their droid R1-J5, a.k.a. Bucket, escape from Major Vonreg in his amazing LEGO Star Wars Major Vonreg TIE Fighter Starship (75240). Help him track them down and then push the trigger to each side to launch the spring-loaded shooters. Then jump him out of the cockpit and chase after those pesky rebels. 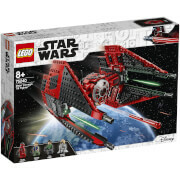 This LEGO Star Wars Major Vonreg TIE Fighter Starship (75240) includes a special black and red colour scheme, opening cockpit with space to sit the Major Vonreg minifigure inside, plus 2 spring-loaded shooters that are fired by moving the trigger left and right. It also includes General Leia and Kaz Xiono LEGO Star Wars minifigures and an R1-J5 droid LEGO figure, a.k.a. Bucket. Celebrate an iconic collaboration with this LEGO Star Wars Clone Scout Walker – 20th Anniversary Edition (75261). This action-packed construction playset celebrates 20 years of LEGO Star Wars sets, including an updated version of the 7250 Clone Scout Walker from 2005 with posable legs, turning turret, space for the Kashyyyk Trooper minifigure on top and a stud shooter. 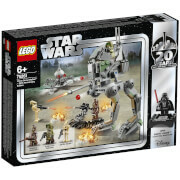 This LEGO Star Wars Clone Scout Walker – 20th Anniversary Edition (75261) also includes a Dwarf Spider Droid LEGO figure with stud shooter, trench section with gun, and Star Wars mini figures including Wookiee Warrior, Kashyyyk Trooper and Battler Droid. 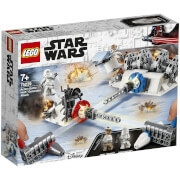 Kids will love to build this LEGO Star Wars Action Battle Endor Assault Set (75238). This set comes with a tree and Imperial speeder bike models with friends and family. Then get ready for action as they load the powerful shooters and try to hit targets to send Wicket the Ewok flying and the Scout Trooper on his speeder bike toppling off the base. 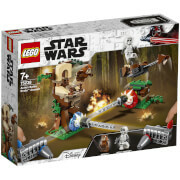 This LEGO Star Wars Action Battle Endor Assault Set (75238) includes 2 Star Wars minifigures: Ewok warrior Wicket and a Scout Trooper, a speeder bike LEGO Star Wars vehicle on a base and a buildable tree, both with a target, 2 shooters and 4 missiles. Celebrate the 20th anniversary of LEGO Star Wars with this detailed reinterpretation of the Boba Fett classic Slave I Starship. 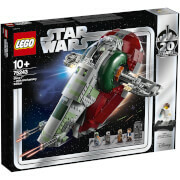 This iconic LEGO Star Wars Boba Fett Classic Slave I Starship (75243) is the most detailed version to date with features such as a self-levelling cockpit seat and side wings, a carry handle for easy transport and trigger-fired spring-loaded shooters. This amazing LEGO Star Wars collectible construction toy also includes a closing rear hatch to store the Han Solo in Carbonite element and 4 LEGO Star Wars minifigures, plus a bonus Princess Leia minifigure and display stand with 20th anniversary logo to mark this momentous milestone in the history of LEGO Star Wars sets. 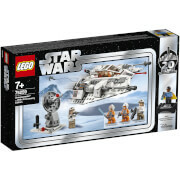 Battle with your friends in a fun and fast-paced LEGO Star Wars Hoth Generator Attack Challenge Set (75239). Build the power generator and tripod gun, then place the Rebel Trooper and Snowtrooper into position. Load the missiles into the shooters, take aim and fire at targets to send their character flying! Can you defeat the mighty Empire in this exciting Battle of Hoth set? 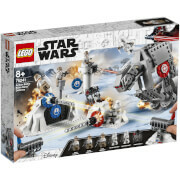 This fun-filled LEGO Star Wars Hoth Generator Attack Challenge Set Includes 2 LEGO Star Wars minifigures: a Snowtrooper and a Rebel Trooper, a tripod gun and buildable power generator, both on a base with target as well as 2 shooters and 4 missiles. This amazing LEGO Star Wars Black Ace TIE Interceptor Starship (75242) is from the TV series Star Wars Resistance. This detailed Star Wars starship features an opening cockpit to sit ace pilot Griff Halloran, 2 spring-loaded shooters on the wingtips and a removable panel at the back to store a spare missile. 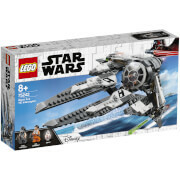 This fun LEGO Star Wars Black Ace TIE Interceptor Starship (75242) includes 2 LEGO Star Wars minifigures and a droid LEGO figure and 2 blaster pistol weapons.